Gupta's "Big bird with folding wing" on a test flight. By mimicking the folding of the bird’s wing, the team was able to slow the flight velocity by 10 percent without any appreciable decrease in the payload capability of the MAV. Bird-like micro air vehicles (MAVs) are expected to play a big role in future surveillance and reconnaissance missions. These remote-controlled MAVs are expected to be stealthy and highly maneuverable for operations in constrained spaces. The U.S. military hopes someday these MAVs will be able to carry surveillance cameras and other payloads that will aid their operations. One can easily imagine how useful such an aircraft could be in gathering data from enemy territory in the mountains of Afghanistan or deserts of Iraq. Students of University of Maryland Professor S.K. 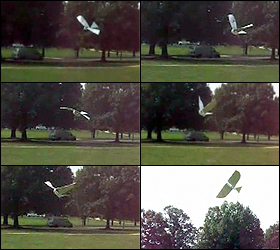 Gupta (ME/ISR) have developed several working versions of an “ornithopter,” a bird-like MAV that both flaps and folds its wings. Ornithopters offer greater possibilities both for miniaturization and maneuverability in the field than their fixed-wing or rotary-wing MAV cousins. Until Gupta’s research made it possible, ornithopters were generating lift primarily by flapping their wings. Gupta’s work on lightweight drive-mechanisms has enabled his team to start testing designs with folding wings. When flying, larger birds like hawks or seagulls fold their wing on the upstroke. This slows their forward velocity and enables them to carry large payloads. (Smaller birds like hummingbirds use a different motion, rotating their wings in flight.) Since it would be highly desirable for a surveillance MAV to fly slowly and carry a significant sensor payload, developing working a folding-wing technology that actually flies is a large step forward in making these aircraft possible. The drive-mechanism is a critical part of the MAV design because it transfers the power from the motor to the flapping wings. Gupta’s team has developed multi-piece molding technology that enables development of geometrically complex structures. Using this technology his team has developed a new lightweight drive mechanism. This drive-mechanism minimizes moving parts by exploiting biologically inspired compliant structures. Elimination of moving parts eliminates power loss during the transmission. Folding wings are heavier than non-folding wings. So advances in lightweight, highly efficient drive-mechanisms have been crucial in achieving folding wing flight. Gupta’s team first developed four flapping-wing MAVs that did not have folding wings, and demonstrated their capacity to fly. Each of these ornithopters was successively larger, so that increasingly heavy payloads could be carried. The length of flight is determined by the capacity of the batteries onboard the aircraft. The largest of these ornithopters, which weighs 1.5 ounces, can carry a video camera with a transmitter as well as its batteries, and stay aloft for 14 minutes in calm air. The video camera’s images can be stabilized via software. The folding-wing version of these MAVs began flying in September 2008. With the folding wing, the aircraft could slow its flight velocity by 10 percent without any appreciable decrease in its payload capacity. The folding-wing MAV weighs 1.3 ounces with its batteries, and has a wing span of 22.5 inches. It is capable of carrying a payload (usually a surveillance camera) that weighs .35 ounces. Importantly, Gupta’s MAVs do not use propeller system to “help” the wings. Such motors are too loud for reconnaissance purposes, forfeiting the element of stealth. “These MAVs are truly bird-inspired,” Gupta says. The next step for Gupta’s team is a “jumbo bird” that will be able to carry a payload of .70 ounces. Eventually this bird will fly along a course using an autopilot flight plan incorporating global positioning system software. The jumbo bird would be a little smaller than the size of a hawk, and will continue the incremental development of this promising technology. Gupta’s research is funded in part by an Army Research Office MURI grant and the National Science Foundation. For more information, contact S.K. Gupta.